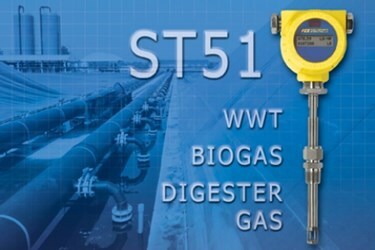 Wastewater treatment process engineers and plant technicians responsible for biogas digester systems that also support co-generation electric power production will find the highly reliable Model ST51 Mass Flow Meter from Fluid Components International (FCI) provides precise air/gas flow measurement in demanding environments. Designed for high performance, the ST51 Flow Meter is an explosion-proof instrument that is easy-to-install and requires virtually no-maintenance to deliver a truly best cost solution in wastewater digester gas systems. The ST51 features a no-moving parts design that’s non-clogging and operates over a wide flow range with low-flow sensitivity. It’s packaged in an explosion-proof transmitter, and the calibration is matched to the user’s actual gas composition and installation conditions. Methane gas flow measurement from anaerobic digesters is a challenge because of the wet, dirty nature of biogas. This type of biogas is a potentially dangerous mixed composition of primarily methane (CH4) and carbon dioxide (CO2), with smaller percentages of hydrogen sulfide (H2S) and other gases. The wetness, H2S and other particulates in the gas create a corrosive condensate that deposits itself on the pipe wall and instruments in the pipe. The gas flow varies widely too—based on fluctuating plant process demands and seasonal variations in temperature and humidity. The ST51 Flow Meter features a thermal mass, insertion-style flow element with flow accuracy to ±1% of reading over a broad flow range from 0.3 to 400 SFPS (0.08 to 122 MPS), and repeatability of ±0.5 percent of reading. The flow element is available for use in line sizes from 2 to 24 inches (51 to 610 mm) diameters. It operates over a wide turndown range of 100:1, which is essential due to the variable gas flows in wastewater treatment plants and landfill gas operations. It operates at temperatures from 0 to 250°F (-18 to 121°C) and withstands pressures up to 500 psig [34 bar (g)]. The ST51 Flow Meter’s thermal mass flow sensing element has no moving parts and no orifices to clog or foul, providing virtually maintenance-free service in dirty biogas applications. The flow element is constructed with a 316L stainless steel body and Hastelloy C-22 thermowell sensors to resist corrosion. It also includes built-in temperature compensation circuitry for accurate, repeatable measurement year-round as temperatures rise and fall seasonally. For ease of use and applications flexibility, the ST51 flow meter is rich with outputs for user interfaces and information. Dual 4-20mA analog outputs are user assignable to flow rate and/or temperature, and there is a 0-1kHz pulse output for totalized flow. The transmitter’s digital communications include an RS-232C port, and with units that have the digital display option there is a wireless IR link for PDA use. The ST51’s optional integral digital display features a two-line, 16-character LCD screen that is easy to read and can be rotated in 90-degree increments for optimum viewing and installation flexibility. The LCD screen’s top line is assigned to flow rate, and the bottom line is user assignable for temperature readings or totalized flow. For applications with difficult access or display readability, the ST51’s flow transmitter is also available in a remote mount configuration that can be mounted up to 50 feet (15m) away from the flow element inserted the pipe. Both the remote mount and integral transmitters are housed in an aluminum enclosure that is NEMA 4X approved and meets IP67 requirements for water and dust ingress protection. Input power for the ST51 can be selected as either 18 to 36 Vdc or 85 to 265 Vac. The ST51 Flow Meter comes with stringent safety approvals for hazardous biogas operating environments. The approvals include: FM, CSA/CRN, Class 1, Div 1, Groups B, C, D; Class 1, Div II, Groups A-D, ATEX Zone 1, II 2 G Ex d IIC T6 …T3, II 2 D Ex tD A21 IP67 T90°C…T300°C.The entire Model ST51 system including the instrument and transmitter is submitted for agency testing. This is done to ensure comprehensive reliability and safety that take into account the sensor and seal requirements as well as the temperature (T) ratings. Fluid Components International is a global company committed to meeting the needs of its customers through innovative solutions to the most challenging requirements for sensing, measuring and controlling flow and level of air, gases and liquids.